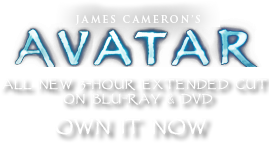 Warning Drum | Pandorapedia: The Official Guide to Pandora | Own AVATAR on Blu-ray & DVD Now! Amplified by the water inside and its placement at a resonant spot at the foot of Hometree, this large drum’s volume is sufficient to warn all Na’vi within a ten-kilometer radius of approaching danger. When the drum is struck with its large smooth wooden beater, the water inside sloshes against the taut hexapede hides, amplifying the volume and changing the resonant pitch of the sound. Some of the warning rhythms played on the drum represent different dangers; other rhythms indicate the direction from which the danger approaches. One rhythm is played when a Na’vi is in mortal danger and in need of assistance from the clan. 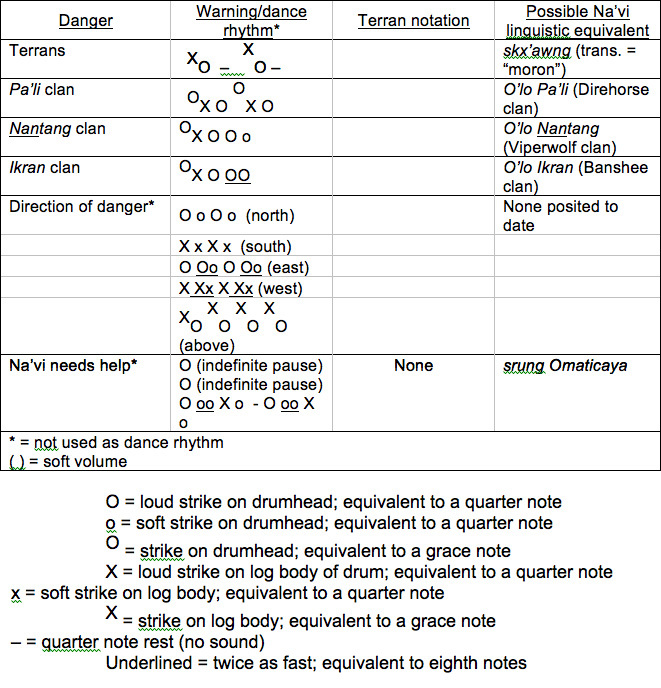 During pre-battle rituals of the past (if the enemy was known), the associated warning rhythms also accompany Na’vi ritual dances (see notation below). As an oral tradition, Na’vi music is not written down and these rhythms (as well as all Na’vi songs) must be learned by ear and committed to memory. Terran linguistic researchers were the first to notate the warning rhythms; xenomusicologists refined the system and transcribed the rhythms into traditional Western European musical notation. The various combinations of rhythms (which indicate the type of danger and the direction from which it comes) are taught to Na’vi children at an early age. For example, the rhythm representing Terrans approaching from the east would be as follows: XO – XO – O Oo O Oo. The rhythms themselves are quite simple, most likely because they are learned in early childhood and all Na’vi must be capable of relaying these warnings by the time they reach puberty (see related article on children’s music). These rhythms have come down from the first Na’vi and over the course of time, their exact origins have been lost. However, there are two schools of thought regarding their creation. Early Terran explorers, based on very limited interaction with the Na’vi prior to the advent of the avatars, believed that these rhythms were based on the orbital patterns of the Na’vi solar system. But no logical correlation has yet been made between these rhythms and the planets’ movements. Most contemporary scholars believe that this theory is based on inaccurate information from the Na’vi, information that was perhaps deliberately obfuscated in an effort to confuse the Terrans. Another possibility is that the Terrans actually saw the Na’vi circular drums, which are arranged in a representation of the solar system. Recent collaborative works by Terran linguists and xenomusicologists, however, have posited that there may be a correlation between these warning rhythms and language in a manner similar to the talking drums of Earth’s West African cultures. Current thinking links the strikes on the wood of the drum (notated as X) with the ejective consonants and glottal stops (sounds made by closing and opening of the throat during speech) of the Na’vi language. Therefore, placement of a quick strike on wood (X) before a drumhead strike (notated as O) mirrors the placement of an ejective consonant. If the pattern is reversed, with a quick strike on the drumhead before a strike on wood, this implies a glottal stop. In fact one xenomusicologist, Dr. Wendy Bryan, has suggested that the warning rhythms represent the names of Na’vi clans. (See the notational chart for possible linguistic links.) In days past (and currently, to a small extent), Na’vi clans battled each other over territory. It is logical to extrapolate, therefore, that warning signals were created to identify which clan was encroaching on Omaticaya territory. The more recent incursions by humans necessitated the addition of another warning rhythm. Following the logic of rhythms representing the specific danger, the most recent warning is for Terrans. Although no Na’vi has confirmed this, Dr. Bryan, working in conjunction with an expert on the Na’vi language, has theorized that the warning rhythm for Terrans XO – XO – is based on the Na’vi word skx’awng, a highly derogatory termed that is more or less analogous to “moron,” or “one who does not See” (e.g., non-Na’vi or Terrans). Function Accompaniment to pre-battle ritual dance, warning signals. Size and Weight One meter high, four meters in diameter, roughly ninety kilograms. Materials and Construction Narrow section of a hollowed log, covered on both sides by tanned hexapede hides. Filled with water. Beating stick is made from smoothed branch the size of a Terran baseball bat.